Since 2011 I have kept a long running post detailing the plants in my garden in St. Helens. My new garden in Cheshire was very overgrown when I moved in so most of it was removed or pruned hard during autumn 2015. The progress of the “re-build” of the garden can be found in my post Dove Cottage Garden but here I will give details of the planting along with links to the actual plants on external websites. The front garden is basically wedged shaped but with a curved, hawthorn hedge at its boundary with the lane. The boundary with the neighbour’s garden was a 8ft high hedge of Leyland cypress (Cupressus × leylandii) which was not in good condition and, with the neighbour’s agreement, I had it removed. In its place we planted bare rooted Viburnum opulus ‘Roseum’ (snowball tree) which is already showing signs of being a very good alternative. For this year I want to leave the area in front of the hedge as open as possible so I have sown annual seeds White Scabious, Ammi majus, Cosmos bipinnatus ‘Purity’, Scabiosa atropurpurea ‘Burgundy Beau’, Nicotiana ‘Perfume Purple’, Nicotiana alata ‘Lime Green’ and Moluccella laevis (all from Sarah Raven) to provide a white, purple and lime green theme. My first permanent plant for this area is Syringa Red Pixie which I’ve planted now to ensure a good display next spring/summer. We also planted a few bare rooted Hawthorn saplings to fill the gap left in the hawthorn hedge by the removal of the Leylandii. The lawn in the front garden had been left to grow a couple of feet high before I moved in and was in very bad condition. We lifted the old turf with a view to conditioning the soil, levelling and returfing. However, there were so many tree roots at the surface of the soil it would be a massive job to level it off enough to have a really fine lawn. Following some research I finally decided to grow a Clover Lawn so during early May I sowed a couple of packets of Trifolium repens (Wild White Clover Seed). It took quite some time for it to germinate which left space for weeds and grass to germinate alongside it so, at the moment, it isn’t looking that good. I will give it a few more weeks and hope that it grows and knits together. Once it has I will post a picture. The front of the house was covered in ivy right up to the guttering and, in places, covering the windows! I had most of the ivy taken down but left two columns either side of the window which I will allow to grow as far as the bedroom window. 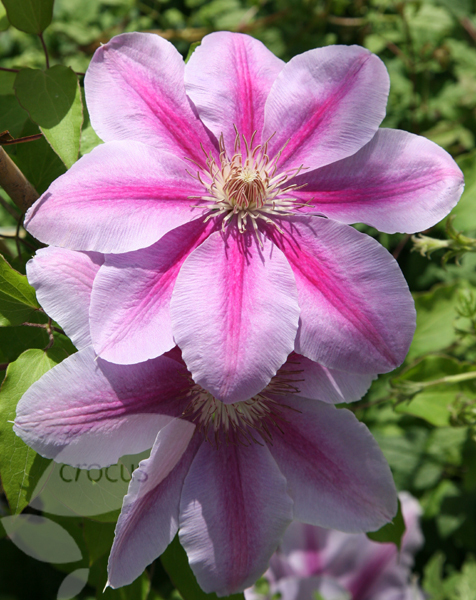 To add colour I have planted two clematis on either side; Clematis Bees Jubilee with Clematis Princess Diana (both deep pink) and Clematis Franzisha Maria with Clematis Princess Kate (white/purple). In front of the Ivy/Clematis I have two Olive trees to provide a bit of shelter for the Clematis roots. There is a rectangular bed running along the path which was full of a white Japanese anemone which I think is Anemone × hybrida ‘Honorine Jobert’. I do like this plant and had it in my old garden but it was left to grow very high and spread even into the lawn so I removed most of it last autumn. Now, in May it is sprouting up all over the bed as I expected but I shall leave it and see how it flowers later in the year. 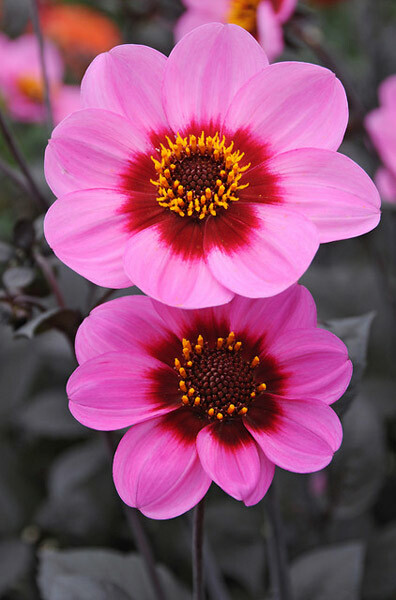 Alongside the Japanese anemone I have planted a number of Dahlias; Dahlia Bishop of Canterbury (red), Dahlia Bishop of Leicester (pink), Dahlia Bishop of York (yellow), Dahlia Sunshine (orange) and Dahlia Happy Single Wink (bright pink). At the end of the bed near the garden gate I have planted a Peony, Paeonia lactiflora ‘Shirley Temple’. I will also put in some bulbs in the autumn for flowering next spring. There is also a bed under the kitchen window which I am going to have as my Rose bed. I have planted ‘Rosa Albertine’ Rambling Rose (to be trained around the door and window), Thomas a Becket English Shrub Rose, Remember Me Hybrid Tea Shrub Rose (the ‘Gardening Register Rose’), Desdemona English Shrub Rose and Teasing Georgia English Shrub Rose along with a shrub given to me by friends; Osmanthus heterophyllus Variegatus. Over the garden gate I am growing James Galway Climbing Rose. Along each side of the small path to the back garden I have planted Camomile which I hope will spread into the path to allow me to walk on it to release the wonderful scent. To the side of the gate in line with the path was a very overgrown hedge of mixed shrubs which I also removed and replanted with bare rooted Rosa rugosa ‘Rubra’ plants, it is already forming a good hedge and I’m looking forward to the deep pink flowers and red hips. Against the brick wall which surrounds the side of the house I have planted Wisteria frutescens ‘Amethyst Falls’ which I will train along a trellis once it is big enough to reach. The back garden consists of a large patio area, a raised bed sweeping across the middle and a lower raised bed at the back; the raised beds are separated by a flagged path. The pathed area is quite large but I would love it to be covered in Camomile or another low, ground cover plant but that is a project for the future. The large patio areas are quite bland so I want to lift odd slabs and plant Lavender to break it up. The back garden had a number of large shrubs which I kept and added to with some I had in pots and are now free to root themselves in the ground. Those which were already in the garden were three, deep pink, Camelia all of which were oddly shaped so I will prune them into a nice shape over the coming years. 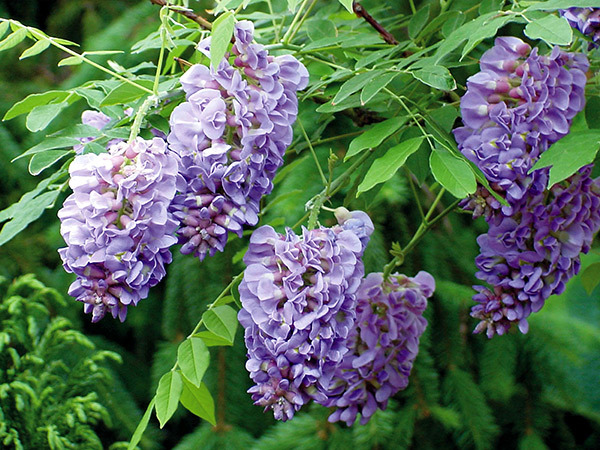 There is also a Mahonia which I don’t actually like but I’m going to use it as a structure to grow Clematis through. 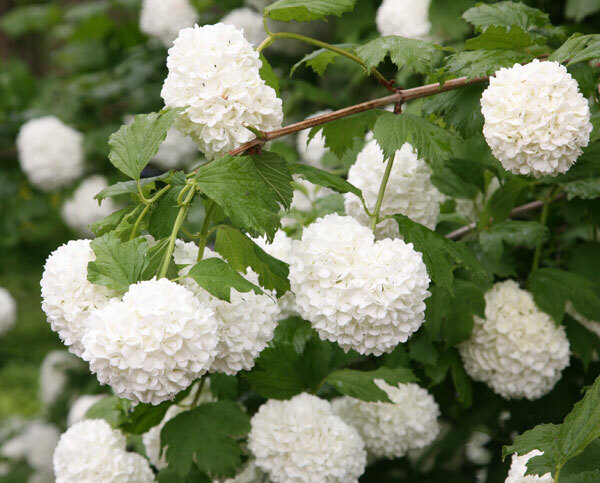 There is also a Viburnum but I don’t know the variety, again it is not that nice really so I’ll use it just for the structure. Those bought from home are a number of Acers which I love; Acer palmatum ‘Bloodgood’, Acer palmatum ‘Orange Dream’, Acer shirasawanum ‘Jordan’ and Acer shirasawanum ‘Aureum’. The final tree released from it’s pot is Cercidiphyllum japonicum (Katsura Tree) which always smelt of toffee apples (or candy floss) far too early because it always dried out in it’s pot!! Hopefully this autumn we’ll get the full impact of the autumn colour and scent which this tree is famous for.